Of Ice And Fire: A Review Of Cathy McSporran’s Cold City… | Scots Whay Hae! * There are just not enough great Glasgow novels; discuss. In perhaps the finest of the few which are, Alasdair Gray’s Lanark, the characters McAlpin and Duncan Thaw discuss why this may be, “Glasgow is a magnificent city,” said McAlpin. “Why do we hardly ever notice that?” “Because nobody imagines living here […] if a city hasn’t been used by an artist, not even the inhabitants live there imaginatively.” If this is the case, any new imagining of Glasgow is to be celebrated. 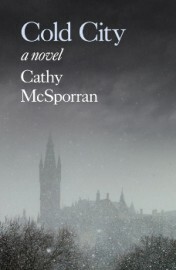 Cathy McSporran’s novel Cold City is just that, and while it is not one of those great novels, there is enough style and innovation to suggest that this is a writer of great promise. The novel opens with Susan Pherson spotting her recently deceased Dad walking on Argyle Street before seeing him entering a building which doesn’t exist. At the time she believes she has seen into a different world. In the following days she feels increasingly cold, unable to find any heat in the city. She cannot even take comfort in sleep, and her situation leads to her taking drastic measures as she becomes desperate for some relief. When she wakes from a period of unconsciousness she finds herself in another Glasgow, one which is familiar, but where her nearest and dearest have led slightly different lives to those she knows, and, to them, she has unexpectedly returned from the dead. With echoes of the aforementioned Lanark, as well as Iain Banks’ The Bridge and Andrew Crumey’s Sputnik Caledonia, Susan finds herself waking alternatively in one of two alternate realities, one where she is being monitored in hospital under a regime of drugs and psychotherapy, and the other which is increasingly more appealing to her despite the city being constantly in deep freeze. It is when she travels between these two worlds that the novel is at its most appealing and unexpected as the reader, like Susan, is never sure where she is going to find herself. Both ‘Glasgows’ are wonderfully portrayed with just enough detail and difference to make them both believable. When Susan walks the streets it fulfils Gray’s wish that the city should be portrayed imaginatively, and you can feel the chill coming off the page. It is when the novel moves events out of the city to the warmer climes of the Scottish Highlands that it becomes less engaging. It is here that Susan confronts charismatic and creepy Christian fundamentalist leader, McLean, and the novel changes pace and tone abruptly. The ‘trips’ to hospital almost stop altogether, and what began as a curious, supernatural tale, almost a Glasgow ghost story, becomes something closer to a political thriller which I found more than a little jarring. Cold City is interesting and thought provoking, but I was so impressed with the first two thirds that I couldn’t help but be disappointed as matters drew to a close. McSporran’s ambition is impressive but in the end I found the novel takes on too much. It touches on alternate realities, religion, paganism, philosophy, Norse mythology, psychoanalysis, sexual identity, grief, politics and much more. The best fiction demands work from readers, but in this instance there are times when the enquiries lead to dead ends. Don’t misunderstand me, Cold City is a remarkable novel in many ways and is definitely worth reading as when it is good it is unforgettable, but it loses its focus and clarity in a manner that almost negates the initial enjoyment, and that is actually more frustrating than reading a novel that is simply, consistently, OK.